Test yourself on the rules of the road with these 75 questions from the DVSA revision question bank on speed limits, junctions, parking, roundabouts, and level crossings. Normally you should travel in the left-hand lane and only use the right-hand lane for overtaking or turning right. Move back into the left lane as soon as it’s safe but don’t cut in across the path of the vehicle you’ve just passed. You can overtake other traffic on either side when travelling in a one-way street. Make full use of your mirrors and ensure that it’s clear all around before you attempt to overtake. Look for signs and road markings and use the most suitable lane for your destination. Pull into the nearest passing place on the left if you meet another vehicle in a narrow road. If the nearest passing place is on the right, wait opposite it. You MUST NOT park or stop on a road marked with double white lines (even where one of the lines is broken) except to pick up or set down passengers. You MUST use parking lights when parking at night on a road or lay-by with a speed limit greater than 30 mph. You MUST also park in the direction of the traffic flow and not close to a junction. If the lights at a level crossing continue to flash after a train has passed, you should still wait as there might be another train coming. Time seems to pass slowly when you’re held up in a queue. Be patient and wait until the lights stop flashing. You may be difficult to see when you’re travelling at night, even on a well lit road. If you use dipped headlights rather than sidelights other road users will see you more easily. The presence of street lights generally shows that there is a 30 mph speed limit, unless signs tell you otherwise. It’s important not to park at or near a bus stop as this could inconvenience passengers, and may put them at risk as they get on or off the bus. The use of cycles is being encouraged and more toucan crossings are being installed. These crossings enable pedestrians and cyclists to cross the path of other traffic. Watch out as cyclists will approach the crossing faster than pedestrians. A long vehicle may have to straddle lanes either on or approaching a roundabout so that the rear wheels don’t cut in over the kerb. If you’re following a long vehicle, stay well back and give it plenty of room. It is against the law to drive on or over a footpath, except to gain access to a property. If you need to cross a pavement, watch for pedestrians in both directions. Ensure that you know the speed limit for the road that you’re on. The speed limit on a dual carriageway or motorway is 70 mph for cars and motorcycles, unless there are signs to indicate otherwise. The speed limits for different types of vehicles are listed in The Highway Code. Practise good observation in all directions before you emerge or make a turn. Proceed only when you’re sure it’s safe to do so. You must also stop if you're involved in an incident which causes damage or injury to any other person, vehicle, animal or property. To go straight ahead at a roundabout you should normally approach in the left-hand lane. You will not normally need to signal, but look out for the road markings. At some roundabouts the left lane on approach is marked as ‘left turn only’, so make sure you use the correct lane to go ahead. Signal before you leave as other road users need to know your intentions. By standing on the pavement, the pedestrian is showing an intention to cross. If you are looking well down the road you will give yourself enough time to slow down and stop safely. Don’t forget to check your mirrors before slowing down. On full beam your lights could dazzle the driver in front. Make sure that your light beam falls short of the vehicle in front. At some junctions the layout may make it difficult to turn offside to offside. If this is the case, be prepared to pass nearside to nearside, but take extra care as your view ahead will be obscured by the vehicle turning in front of you. Toucan crossings are similar to pelican crossings but there's no flashing amber phase. Cyclists share the crossing with pedestrians and are allowed to cycle across when the green cycle symbol is shown. 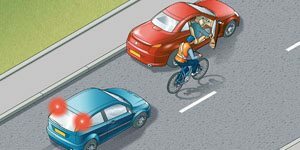 Don’t turn round in a busy street or reverse from a side road into a main road. Find a quiet side road and choose a place where you won’t obstruct an entrance or exit. Look out for pedestrians and cyclists as well as other traffic. Make sure you carry out the manoeuvre without causing a hazard to other vehicles. Choose a place to turn which is safe and convenient for you and for other road users. When towing trailers, speed limits are also lower on dual carriageways and motorways. These speed limits apply to vehicles pulling all sorts of trailers including caravans, horse boxes etc. The cycle lanes are there for a reason. Keep them free and allow cyclists to use them. It is illegal to drive or park in a cycle lane, marked by a solid white line, during its hours of operation. Parking in a cycle lane will obstruct cyclists and they may move into the path of traffic on the main carriageway as they ride around the obstruction. This could be hazardous for both the cyclist and other road users. Where there are extra hazards such as roadworks, it’s often necessary to slow traffic down by imposing a temporary speed limit. These speed limits aren’t advisory, they must be obeyed. This sign indicates that there are waiting restrictions. It is normally accompanied by details of when restrictions are in force. Details of most signs which are in common use are shown in The Highway Code and a more comprehensive selection is available in Know Your Traffic Signs. Keep going, don’t stop on the crossing. If the amber warning lights come on as you’re approaching the crossing, you MUST stop unless it is unsafe to do so. Red flashing lights together with an audible signal mean you MUST stop. You MUST obey signals to stop given by police and traffic officers, traffic wardens and school crossing patrols. Failure to do so is an offence and could lead to prosecution. Clearways are in place so that traffic can flow without the obstruction of parked vehicles. Just one parked vehicle will cause an obstruction for all other traffic. You MUST NOT stop where a clearway is in force, not even to pick up or set down passengers. • drivers opening their doors. Your brake lights will give an indication to traffic behind that you’re slowing down. Good anticipation will allow you time to check your mirrors before slowing. Long vehicles might have to take a slightly different position when approaching the roundabout or going around it. This is to stop the rear of the vehicle cutting in and mounting the kerb. Don’t forget to put your seat belt back on when you’ve finished reversing. At a level crossing flashing red lights mean you must stop. If the train passes but the lights keep flashing, wait. There may be another train coming. Red rear reflectors show up when headlights shine on them. These are useful when you are parked at night but will only reflect if you park in the same direction as the traffic flow. Normally you should park on the left, but if you’re in a one-way street you may also park on the right-hand side. Where signs or road markings show lanes are for cyclists only, leave them free. Don’t drive or park in a cycle lane unless it is unavoidable. You may decide to turn your vehicle around by reversing into an opening or side road. When you reverse, always look behind and all around and watch for pedestrians. Don’t reverse from a side road into a main road. You MUST NOT reverse further than is necessary. At a crossroads where there are no ‘give way’ signs or road markings be very careful. No vehicle has priority, even if the sizes of the roads are different. If there is no-one on the crossing when the amber light is flashing, you may proceed over the crossing. You don’t need to wait for the green light to show. If you aren’t sure of the speed limit a good indication is the presence of street lights. If there is street lighting the speed limit will be 30 mph unless otherwise indicated. Take care if you have to pass a parked vehicle on your side of the road. Give way to oncoming traffic if there isn’t enough room for you both to continue safely. Urban clearways may be in built-up areas and their times of operation will be clearly signed. You should stop only for as long as is reasonable to pick up or set down passengers. You should ensure that you are not causing an obstruction for other traffic. You can move into the box junction to wait as long as your exit is clear. The oncoming traffic will stop when the traffic lights change, allowing you to proceed. If you can’t see all around your vehicle get out and have a look. You could also ask someone reliable outside the vehicle to guide you. A small child could easily be hidden directly behind you. Don’t take risks. Don’t swing out into the centre of the road in order to make the turn. This could endanger oncoming traffic and may cause other road users to misunderstand your intentions. There are times where road markings can be obscured by queuing traffic, or you might be unsure which lane you need to be in. If you realise that you’re in the wrong lane, don’t cut across lanes or bully other drivers to let you in. Follow the lane you’re in and find somewhere safe to turn around if you need to. You'll find traffic officers on motorways in England and Wales as well as some primary routes. They work in partnership with the police, helping to keep traffic moving and helping to make your journey as safe as possible. It's an offence not to comply with the directions given by a traffic officer. Don’t park within 10 metres (32 feet) of a junction (unless in an authorised parking place). This is to allow drivers emerging from, or turning into, the junction a clear view of the road they are joining. It also allows them to see hazards such as pedestrians or cyclists at the junction. If there is a bend just before the level crossing you may not be able to see the level crossing barriers or waiting traffic. These signs give you an early warning that you may find these hazards just around the bend. A red slash through this sign indicates that the restriction has ended. In this case the restriction was a minimum speed limit of 30 mph. Don’t park in a space reserved for disabled people unless you or your passenger are a disabled badge holder. The badge must be displayed in your vehicle in the bottom left- hand corner of the windscreen. Always check road and traffic conditions in all directions before reversing into a side road. Keep a good look-out throughout the manoeuvre. Act on what you see and wait if necessary. If you have a garage, use it. Your vehicle is less likely to be a victim of car crime if it’s in a garage. Also in winter the windows will be free from ice and snow. It is illegal to park in a parking space reserved for disabled users. These spaces are provided for people with limited mobility, who may need extra space to get in and out of their vehicle. The blue and red circular sign on its own means that waiting restrictions are in force. This sign shows that you are leaving the controlled zone and waiting restrictions no longer apply. Exceeding the speed limit is dangerous and can result in you receiving penalty points on your licence. It isn’t worth it. You should know the speed limit for the road that you’re on by observing the road signs. Different speed limits apply if you are towing a trailer. Leave the lane free for cyclists. At other times, when the lane is not in operation, you should still be aware that there may be cyclists about. Give them room and don’t pass too closely. • leave changing lanes until the last moment. The speed limit is reduced for vehicles towing caravans and trailers, to lessen the risk of the outfit becoming unstable. Due to the increased weight and size of the vehicle and caravan combination, you should plan well ahead. Be extra-careful in windy weather, as strong winds could cause a caravan or large trailer to snake from side to side. Parking restrictions apply in a variety of places and situations. Make sure you know the rules and understand where and when restrictions apply. Controlled parking areas will be indicated by signs and road markings. Parking in the wrong place could cause an obstruction and danger to other traffic. It can also result in a fine. This sign doesn’t tell you the speed limit in figures. You should know the speed limit for the type of road that you’re on. Study your copy of The Highway Code. When the central reservation is narrow you should treat a dual carriageway as one road. Wait until the road is clear in both directions before emerging to turn right. If you try to treat it as two separate roads and wait in the middle, you are likely to cause an obstruction and possibly a collision. Never overtake if you’re not sure whether it’s safe. Can you see far enough down the road to ensure that you can complete the manoeuvre safely? If the answer is no, DON’T GO. Yellow box junctions are marked on the road to prevent the road becoming blocked. Don’t enter one unless your exit road is clear. You may only wait in the yellow box if your exit road is clear but oncoming traffic is preventing you from completing the turn. Don’t reverse into a main road from a side road. The main road is likely to be busy and the traffic on it moving quickly. Cut down the risks by reversing into a quiet side road. You should normally use the left-hand lane on any dual carriageway unless you are overtaking or turning right. When overtaking on a dual carriageway, look for vehicles ahead that are turning right. They’re likely to be slowing or stopped. You need to see them in good time so that you can take appropriate action. When parking at night, park in the direction of the traffic. This will enable other road users to see the reflectors on the rear of your vehicle. You MUST use your sidelights when parking on a road, or in a lay-by on a road, where the speed limit is over 30 mph. Some bus lanes only operate during peak hours and other vehicles may use them outside these hours. Make sure you check the sign for the hours of operation before driving in a bus lane. This light allows time for the pedestrians already on the crossing to get to the other side in their own time, without being rushed. Don’t rev your engine or start to move off while they are still crossing. It may be tempting to park where you shouldn’t while you run a quick errand. Careless parking, such as by a bus stop or outside a school, is a selfish act and could endanger other road users. Whenever possible park in an area which will be well lit at night.